A wall oven can be a great alternative to a slide-in or freestanding range for those who prefer not to bend down to access the oven. Beyond ergonomic reasons, wall ovens also allow for numerous placement and combination options within your kitchen. Given that you have the space, you can install two wall ovens, a wall oven with a steam oven, a wall oven with a warming drawer, and more. Two great options for higher end wall ovens are Miele’s MasterChef Series, and the Bosch Benchmark wall ovens. 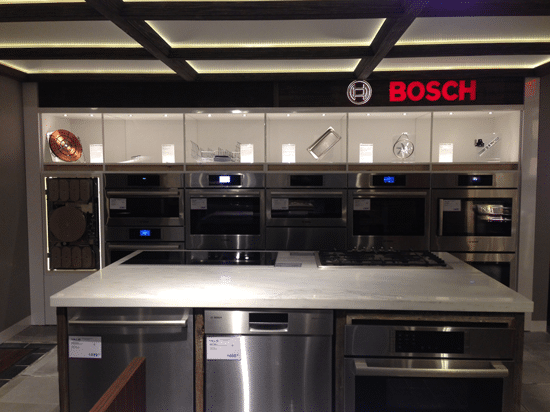 The Bosch Benchmark wall oven is scheduled to be available in mid-April. Both of these ovens feature LCD controls, stored-recipe settings, self-clean and sleek aesthetics. They both have interior lights, and offer true European convection. However, there are some significant differences to consider between both brands. Miele was founded by Carl Miele and Reinhard Zinkann in 1899, and has been a family-owned, family-run company ever since. The German company’s tagline is “Immer Besser”, meaning “Forever Better". They are a quality driven company, and they manufacture rather than outsource even the parts for the appliances. 96.8% of the parts for their dishwasher, for example, are directly produced by Miele. Due to such devotion to quality, Miele has become the most reliable appliance company in the industry. 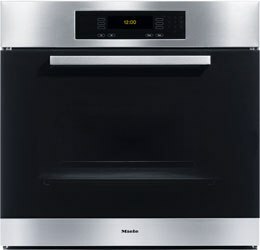 The Miele MasterChef Series wall oven is one of the top wall ovens on the market. This oven has an intuitive control panel that can help even the most inexperienced chef create perfectly cooked meals. All you need to do is select the type food you are trying to cook, and the oven automatically selects the proper cooking mode for you. The oven has a favorites mode for you to store your go-to meal settings. It has a square handle, and black glass with stainless steel front. Bosch is part of the BSH organization, Bosch and Siemens Home Appliance Group, the third largest appliance manufacturer in the world. Based in Munich, Germany, Bosch has been selling high performance German-engineered appliances in the United States since 1991. Like Miele, their dishwashers are renown for quality and have branched out into cooking as well. Benchmark will be directly competitive to Miele in styling for a lower price. The Bosch Benchmark line is a refreshing new offering in the higher end market. This wall oven, in particular, offers some interesting, unique features and benefits. First the oven is available in a side swing door. I like side swings, because you are not lifting a heavy turkey over a door. It seems more practical. This wall oven also has an AutoProbe eliminating the guesswork out of cooking meats. In other words, if you want your meat cooked medium, this probe will assure the correct temperature inside the meat. The pizza mode is great for making a perfectly cooked pizza. The LCD screen is also intuitive like Miele. Available in left swing, right swing, and traditional bottom hinge door. This really depends. Miele is slightly more technologically advanced than the Bosch Benchmark. Although both brands are reliable, Miele is the most reliable brand sold. However, Bosch Benchmark is $1,400 less. I also like the side swing, and the package opportunities with other Bosch products. Get the Yale Wall Oven Buyers Guide with features, specs and inside tips to all the brands. Over 55,000 people have read a Yale Guide.